Vida Aguacate > Recipes > Avocados for a sweet Valentine’s Day! Avocados for a sweet Valentine’s Day! Demonstrate your love for those special people with a delicious dessert made with love, but mainly a special ingredient…Avocados from Mexico. 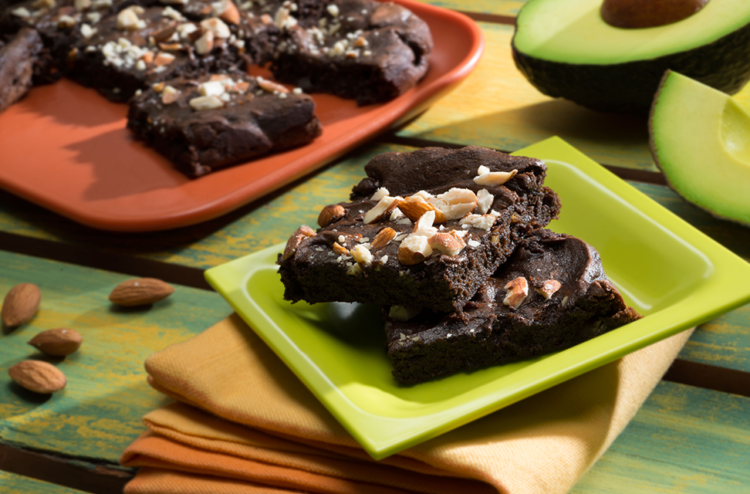 Here we bring you a delicious recipe for Chocolate brownies and avocado. 1/2 cup of semi-sweet chocolate; 2 eggs; 1 ripe Avocado from Mexico; 1 teaspoon of vanilla essence; 3/4 cup of cocoa powder; 1/2 cup of sugar; 3 tablespoons of ground almonds; 1 teaspoon of baking powder and 1/2 teaspoon of granulated instant coffee. Preheat the oven to 350° F. Spray a baking pan with a non-stick spray. Place the chocolate in a microwave safe bowl and melt in intervals of 15 to 20 seconds, mixing constantly. Once the chocolate is melted, add eggs, pulp from avocado, and vanilla essence, mixing constantly so the eggs do not set. Then, add the dry ingredients; cocoa, almonds, baking powder and instant coffee. Mix until it is well blended. Dump the mixture into the baking pan and bake for 20 minutes or until you can stick a toothpick through the center and it comes out clean. You can also impress your friends with a Ganache cake with avocados and chocolate. Nobody will be able to resist this dessert because besides being delicious it is made from avocados. 2/3 cups of dried cherries; 1/2 cup of hot water; 1/2 diced Avocado from Mexico; 4 tablespoons of unsalted butter ( and a little more for the mold); 1 cup of sugar; 1 large egg; 1 cup of flour ( and a little more to dust the mold); 2/3 cup of cocoa powder; 1/2 teaspoon of baking powder; 1/2 teaspoon of baking soda; 1/8 teaspoon of salt; 1/2 cup of whole milk. Place the oven rack in the middle and preheat to 350° F. Grease and dust a square 8 x 8 inch mold. Place the cherries in a bowl and cover with hot water. In another bowl, place the avocado pulp and butter. Mix until it is smooth and creamy (2 to 3 minutes). Add the sugar and egg and continue mixing to blend well, another 2 to 3 minutes. Meanwhile, combine the dry ingredients in another bowl. Add little by little to the wet ingredients, alternating with milk. Lastly, add the cherries with the water. Mix well, dump into the mold and bake for 40 minutes. Let it cool in the mold. Once it is cold, remove from the mold with the aid of a dish.